I have been working so hard the past few weeks on introducing new prints to my shop. I had a stack of paintings just waiting for me to spend some time with my computer and printer. 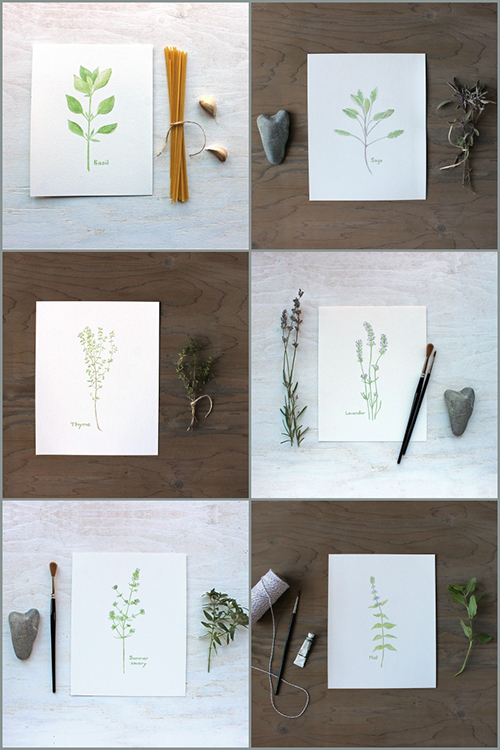 Today, I listed my Herb Collection prints in my shop. I am such a perfectionist and I am thrilled with how they turned out. It always matters to me to get the details right. The paper I chose to print them on is really lovely. I don't think that the photos do justice to the delicate detail of the watercolour images and the beautiful texture of the paper. You can have a closer look at the six images in my shop. They are: basil, sage, thyme, lavender, summer savory and mint. I hope you like them! The herbs in the top photo are from my garden. I picked bunches of them a few weeks ago to dry. I hung them from a big, beautiful branch that I had trimmed off of my spindle tree. That branch now hangs on my dining room wall right above the computer where I am typing this post. I love having herbs in my garden and I will really miss them this winter. Here is one of my favourite recipes from this past summer. 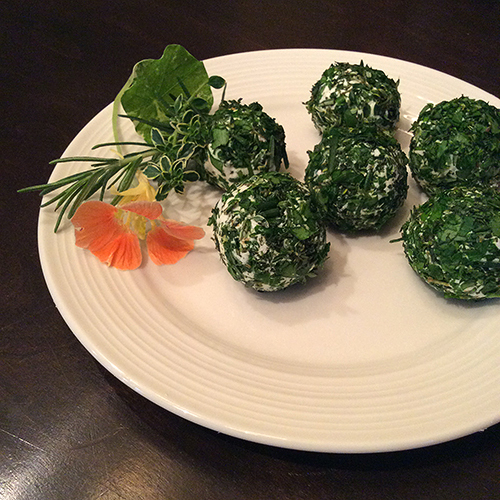 I formed soft goat cheese into balls and then rolled them in a combination of fresh herbs. I put them in a jar full of olive oil and kept them in the fridge. They were absolutely delicious on slices of baguette. A real hit! The leftover olive oil had bits of herbs and goat cheese in it and was perfect in salad dressings and in pasta recipes. While I am itching to get back to painting, I have a few more prints to make. Next will be a set of four pansy prints based on paintings I did a few months ago. 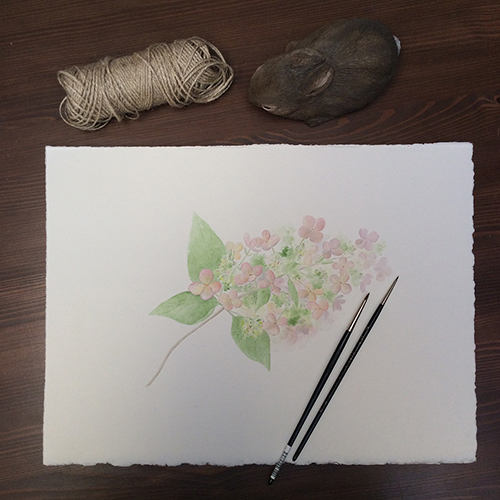 After that, I will be framing a selection of my small watercolour paintings to sell in my shop. They will be perfect for holiday gift giving! 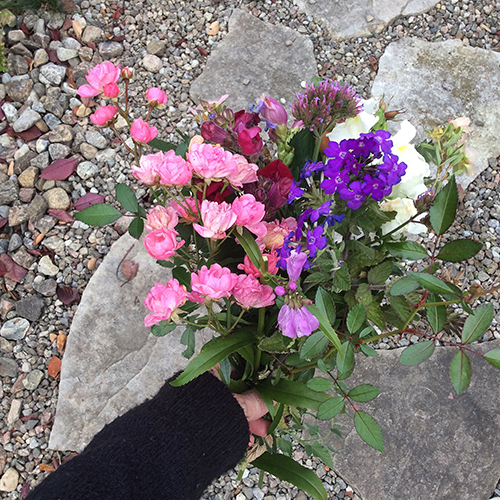 I wanted to take a moment to say thank you for the overwhelming response to my last blog post. It was difficult yet comforting to know that so many of us have been feeling the same things about our Etsy experience, especially during the past year. Thank you for your support. It means so much to me. A little over a year ago, in September, Etsy changed dramatically. They had already been making changes that were unpalatable for many of us by distancing themselves from their handmade origins and allowing manufactured products. In September of 2014, they changed the look, feeling and heart of their site by removing the treasuries (curated collections of products) from their front page. Making treasuries was a creative, collaborative exercise that I enjoyed very much. It was a way to get to know other shop owners from across the world and to actively promote beautiful products. My paintings would sometimes make it onto Etsy's front page and it was always a huge thrill. The front page change was a shock to many of us as it didn't just affect the look of the site but the entire way that we had interacted with it and each other. I didn't fully understand how emotionally invested I was in Etsy until then. I spent days in tears. My husband would come home from work and find me in front of the computer with tears streaming down my face. "Etsy?" he would ask. Yes, I would nod. It's hard to explain. But the shift was profound and I know many others who were similarly affected. After the initial shock and the realization that this was a permanent change, many treasury teams disbanded. What was the point of them if hardly anyone was going to see the treasuries they made? Some stores left Etsy and set up shop elsewhere. Others held on, hoping that maybe the new version of Etsy would still hold worth and meaning. I guess I was one of them. The closest analogy I can think of is the realization that your loved one has changed profoundly and that they may no longer be 'the one'. It's hard to make a complete break. You want to believe that the time and emotion you invested are still worth something. You distance yourself. You separate but you leave a change of clothes and a toothbrush at their place, well because maybe? So my Etsy shop has remained open. One of the most positive things that happened to me last autumn was being invited to be part of a fabulous group of handmade artists and vintage shop owners called Tributary Goods. They created their own collaborative shop of products outside of Etsy and have provided support to each other as most of us began the process of setting up our own independent e-shops. We get each other. There's a lot of strength and a ton of humour. If you have read my blog this past year, you will know that I bought my own domain name and opened a Big Cartel shop in January. It was a good first step. While I liked how it looked, in June I moved my shop to Shopify for the increased flexibility it gave me in terms of the design and organization of my website. I am very happy there. I love how my shop looks and I am impressed on an ongoing basis with the customer service that Shopify provides. It's stellar. It also makes me proud to be associated with a growing, innovative Canadian business providing e-commerce opportunities to merchants worldwide. Last month, Etsy rearranged the categories on their front page. Art is no longer a main category. If I was sticking around because I thought that maybe they still loved me, I guess this made things abundantly clear. There were no tears this time. Today is the fourth anniversary of the day I opened my shop on Etsy. While my love for Etsy as a company is not there anymore, I know I learned a lot from them. Most of all, I feel huge gratitude to everyone who has bought art from me online since October of 2011. I'm also thankful for the friends I have made there among fellow shop owners. So many amazingly creative people. I still have some products in my Etsy shop but I am not renewing them when they expire. I am only listing my new paintings and prints on Shopify now. Slowly but very surely, I am moving towards creative control and independence, and concentrating on positive change. 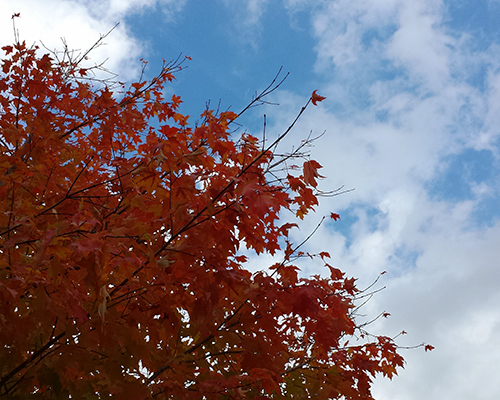 Blue skies and possibilities. Do you know what? It feels really good. 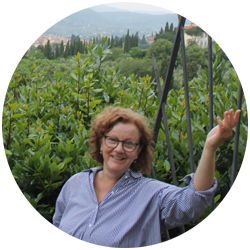 "I feel huge gratitude to everyone who has bought art from me online." When the seasons change, I'm always a little sad about what I need to say goodbye to, but what awaits me often makes up for it. Like autumn and hydrangeas. Yes. 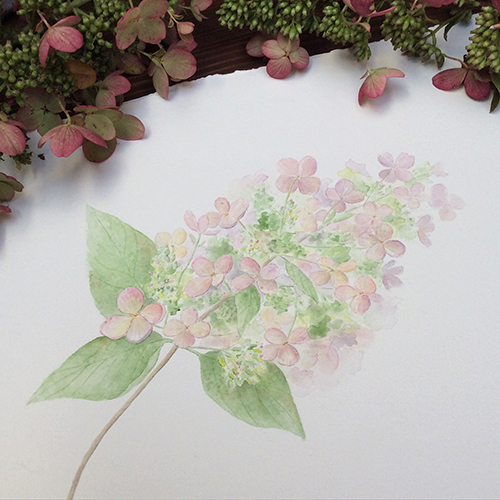 If I were to list my favourite autumn flowers, hydrangeas would be at the top. There are others (Japanese anemones and Turtleheads come to mind) but it's hard not to love those gorgeous billowy flowerheads with their delicate tones of pink and green. I have four types of hydrangeas in my garden: Hydrangea paniculata grandiflora, Hydrangea paniculata 'Unique', oakleaf hydrangea and Hydrangea macrophylla. 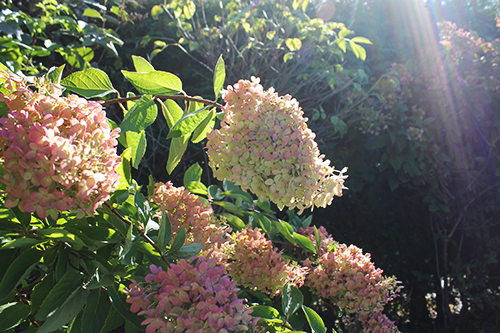 The two that do best in my garden are Hydrangea paniculata grandiflora (PeeGee) and Hydrangea paniculata 'Unique'. Although the PeeGee blooms are beautiful (they're in the photo at the top), the Unique blooms are my favourite. There's more space between the flowers so you can appreciate their individual, graceful shapes. It was still in progress at this point. I started a painting last autumn of some of the Unique blooms. It was almost finished and then, for some reason, I put it away in my painting drawer. I can't really remember why. 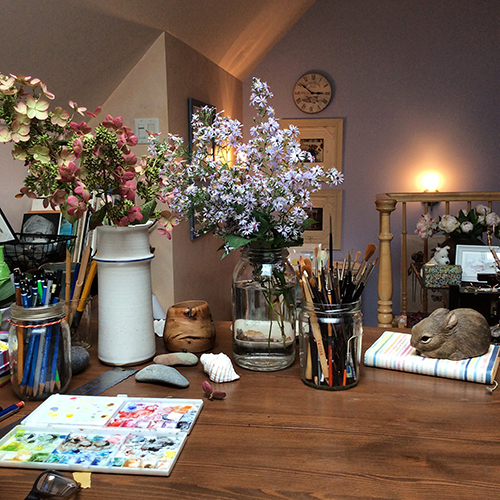 I got it out again last week and with fresh hydrangeas from the garden put the finishing touches on the painting. It just needed a little more depth in places and a few more details. Here's the final result. I tried to convey the frothy softness of the flowerhead while also capturing some of the delicate details. I hope to have it available as a print in the next few weeks. I need to get out into the garden as much as possible in the days ahead. 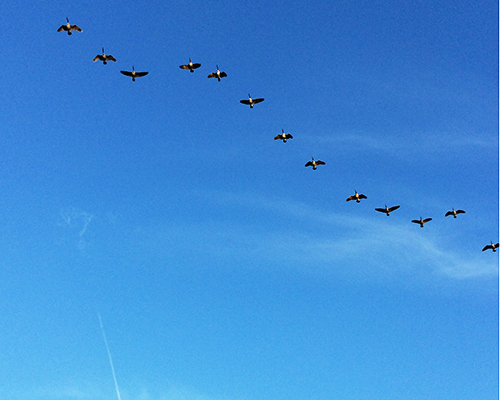 The nights have been very cold the past few days so things are going to change dramatically. This weekend, I plan to bring the last tomatoes in and cut some herbs for drying. And more hydrangeas! Drying tip: I like to dry the hydrangeas and enjoy them throughout the winter months. I read a tip years ago by a favourite gardening writer, Lois Hole, on her preferred way of doing it. 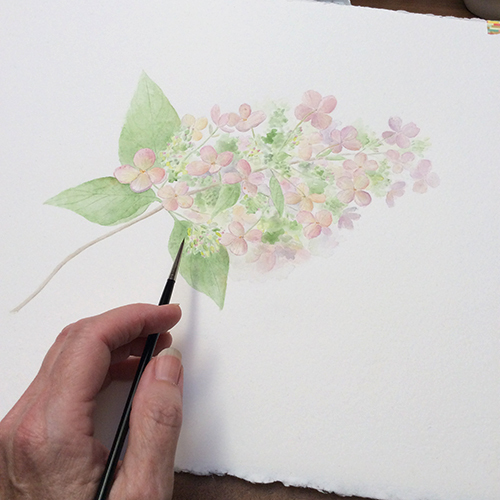 She suggested placing the cut hydrangeas in a vase in about an inch of water and letting it evaporate. She said that the flowers retain more colour this way than if they are air-dried. This is the way I always do it now.